Clownfish became a household name over a decade ago when Disney released the movie "Finding Nemo." Found exclusively in the Indo-Pacific, clownfish are symbiotic animals that only live in sea anemones, a close relative of corals that don't have a hard outer shell. The anemone provides a home and protection for the clownfish, while the clownfish provides food for the anemone. As global concern grows for Australia's Great Barrier Reef -- which is experiencing the worst bleaching event in its history due to sustained high ocean temperatures amid a strong El Nino weather pattern -- University of Delaware researcher Danielle Dixson has co-authored a paper demonstrating how vulnerable clownfish are to the increased frequency of bleaching events. Published today in Proceedings of the Royal Society B: Biological Sciences and co-authored with Anna Scott, a researcher at Southern Cross University in Australia, the paper illustrates that while clownfish can identify -- through smell alone -- if their potential home is bleached or healthy, they are inflexible in selecting a habitat. "Unfortunately, our research has shown that bleaching does not break the symbiotic relationship between the anemone and clownfish. Clownfish are so behaviorally linked to one or a few particular anemone species for a home, that it limits their ability to acclimate if an entire reef bleaches," explained Dixson, an assistant professor of marine science and policy in UD's College of Earth, Ocean, and Environment. "This means that clownfish are setting themselves up for bigger risk because we know that fish that go to bleached coral or anemones have an increased predation risk." There are 28 species of clownfish and 10 species of host anemones. Each clownfish species uses the host anemone species to varying degrees. "Clownfish are all habitat specialists in that they live exclusively in anemones, but some are more specialized than others. We wanted to see if the chemical cues coming from a bleached anemone were different than a nonbleached host and, if clownfish can recognize that a host is bleached, how hardwired are they to select a host versus a healthy non-host species?" explained Dixson. In their study, the researchers tested five species of clownfish and three host sea anemones to determine whether the fish had the olfactory capability to distinguish between bleached and unbleached hosts, and how this may affect settlement decisions. The fish were individually placed in a small vessel called a choice flume containing two streams of water flowing parallel at identical rates but containing different chemical cues. Dixson, an expert in understanding chemical cue use in fish, recorded the fish's location every 5 seconds over a two minute period; then switched the water source and repeated the test with the chemical cues on the opposite side of the flume to validate the data. 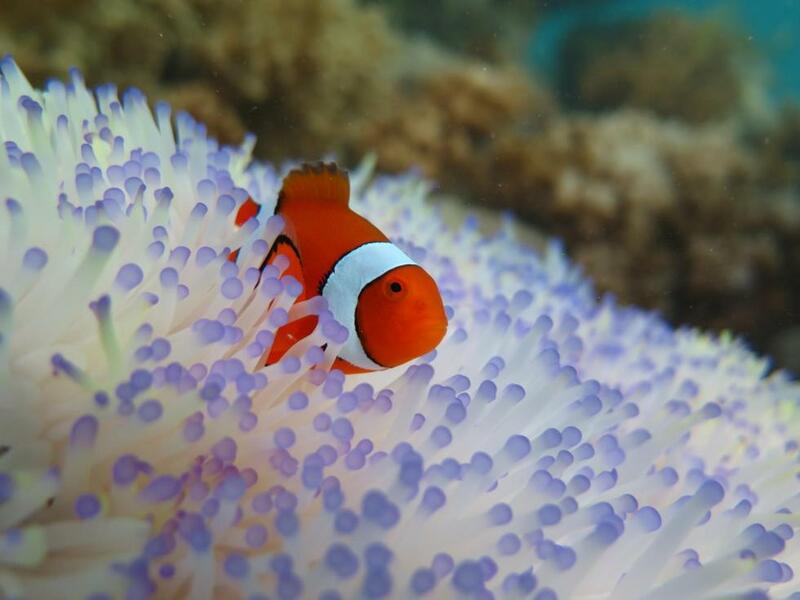 The researcher's results revealed that all clownfish were able to distinguish between bleached and unbleached anemones. Given the option of a healthy or bleached anemone of their host species, all clownfish chose the healthy option. But given the choice between a bleached anemone of their preferred host and another anemone species that was healthy, the clownfish chose the bleached host. These findings highlight the potentially harmful indirect effects declining habitat quality can have on species like clownfish, who are very specific about their habitat. "Broadly, if bleaching incidents continue to increase in frequency there is a risk to species survival," Dixson said. For clownfish species that have a broader geographic range, if temperatures get too hot and the anemones bleach in one region, Dixson said, theoretically on a species level, the clownfish could potentially shift their distribution to cooler waters. "The exception to this idea is A. latezonatus, which are already at the lower limit of their habitat; they can't really move further south unless the anemones migrate, too," Dixson said. "And then there is P. biaculeatus, which only lives in a specific anemone, the bubble-tip anemone, and won't use an alternative, even when its home is unhealthy." As moviegoers with young children anxiously await Disney's follow up film, "Finding Dory," scheduled for release next month, Dixson remains apprehensive about the fate of anemone and clownfish and other reef species that call Australia's Great Barrier Reef home. "Some of the corals must be over a hundred years old and now they are completely white. It's devastating," Dixson said. "If, on Lizard Island where I did my doctoral work, 80 percent of the reef bleaches, the remaining 20 percent cannot support all of the species." Equally concerning is the clownfish's inflexibility when it comes to house hunting. This can prove problematic, because once established, clownfish cannot relocate easily due to the species' innate hierarchy. They are sequential hermaphrodites, which means that all clownfish are born male and the largest on a particular anemone becomes the female. The next largest male is the reproductive male, while the others queue up behind waiting for their chance to reproduce. "It's not like if your anemone bleaches an adult clownfish can go to the next anemone and be accepted. Clownfish can live decades. Just think if you waited 20 years for your chance to be reproductive, it's a big deal if someone jumps the line and breaks the order. So they are aggressive when it comes to protecting their place," Dixson said. In related research, Rohan Brooker, a UD post-doctoral fellow working with Dixson, is investigating the way marine animals use chemistry to hide from predators, a process known as chemical crypsis. Brooker recently received a grant from National Geographic to explore the behavioral and biochemical processes that drive chemical crypsis. On coral reefs, chemical crypsis has the potential to affect how predators and prey interact and so could influence many important ecological processes, including how clownfish or other fish will hide in an increasingly bleached environment. With this new funding, Brooker will work to determine how this mechanism influences predator-prey dynamics and to identify how it will be affected by degrading coral reef environments. A report commissioned by the United Nations and co-authored by the University of Sydney's UNESCO Chair in Marine Science offers a glimmer of hope to those managing the impact of bleaching on the world's coral reefs, including the Great Barrier Reef. This is a Leptoseris coral-dominated Mesophotic Coral Ecosystem in the 'Au'au Channel, offshore of Maui, Hawai'i, depth of 70m. Credit: NOAA's Hawai'i Undersea Research Laboratory. Coral bleaching has affected virtually the entire Great Barrier Reef and many other coral reef systems globally, a result of the continuing rise in global temperatures and exacerbated by the summer's major El Niño event. The 35 authors of the United Nations Environmental Programme report -- including the University's Professor Elaine Baker in the School of Geosciences -- say as the world's surface reefs are being threatened, part of the ecosystem may survive in these barely known deeper environments, known as mesophotic coral ecosystems (MCEs). Shallow coral reefs from the water's surface to 30-40 metres depth are the tip of the iceberg that comprises the ocean's extensive coral ecosystem. MCEs are intermediate depth reefs starting at about 40 metres depth and continuing to around 150 metres. The report being launched today -- 'Mesophotic Coral Ecosystems A lifeboat for coral reefs?' -- looks at the role MCEs could play in the preservation of shallower reefs. "Mesophotic coral ecosystems are a seed bank for some organisms," said Professor Baker. "More research needs to be done to firmly establish the role of MCEs in preserving our reefs; they aren't a silver bullet but they may be able to resist the most immediate impacts of climate change -- thereby providing a refuge for some species and potentially helping to replenish destroyed surface reef and fish populations. "It may be that the cooler, deeper water in MCEs could be more hospitable to many species than the warmer surface water," she said. "They also are less prone to waves and turbulence, therefore potentially offering a more stable environment." The report found some deep mesophotic coral ecosystems may be less vulnerable to the most extreme ocean warming, but others may be just as vulnerable as their shallow counterparts and cannot be relied on to act as "life boats." It has been a bad year for coral. There has been unprecedented coral bleaching on the northern and central Great Barrier Reef, one of the world’s most iconic reefs and a world heritage site. Bleaching in the central Indian Ocean is also severe, in the Maldives, Sri Lanka and in the Lakshadweep islands of India, where up to 100 per cent of corals are bleached in some locations. Many will not survive. The bleaching is caused by an unusually strong El Nino and the background global warming from human greenhouse gas emissions. However, a new tool and a report being launched today at the second United Nations Environment Assembly (UNEA-2) in Nairobi outlines ways to protect these threatened coral reefs. A dataset by the United Nations Environment Programme (UNEP), National Oceanic and Atmospheric Administration (NOAA), World Wildlife Fund (WWF), and the Pacific Islands Climate Science Center of the USGS provides a new tool to prioritize reef management in the face of climate change. By downscaling climate model projections for coral bleaching conditions, the time when severe bleaching conditions can be expected at a frequency of twice per decade, and when bleaching can be expected annually, has been identified, for all the world’s coral reefs, at a resolution of 4km. Meanwhile, a new report shows that coral ecosystems that live in low light conditions come to the rescue in some situations.Mesophotic Coral Ecosystems A lifeboat for coral reefs?examines what we know – and don’t know – about these important submerged reefs. Bleaching is chief among the threats of climate change to coral reefs. When bleaching occurs frequently, reefs become more vulnerable to erosion, they lose their structure, which in turn means their productivity and provision of ecosystems services diminish. This will have wide-ranging impact on coastal dwellers in more than 100 countries (including most Small Island Developing States), affecting in particular people who depend on reefs for income or food, as well as industry sectors developed around reefs, such as tourism. As the global climate heats up, shallow coral reefs will experience increasing levels of catastrophic bleaching and mortality. Worryingly, even if emission reduction committed to by countries in the Paris Agreement are achieved, more than three quarters of all the world’s reefs will experience bleaching conditions annually within this century. However, there is also a glimmer of hope in the great variation within and among countries. “Many reefs are projected to experience annual bleaching conditions more than 10 years later than reefs within the same country or territory” says Dr. Ruben van Hooidonk, NOAA Atlantic Oceanographic and Meteorological Laboratory. “These ‘relative refugia’ are coral reef conservation priorities, and can be found within 16 of the 20 countries with the greatest reef area in the world, including e.g. Indonesia, the Philippines, Malaysia and Australia. To buy coral reefs more time and to support recovery of reefs that have bleached severely, some researchers are looking deeper for answers. They are studying submerged, light-dependent reefs to see if they may serve as lifeboats for nearby, connected shallow reefs that have been damaged by repeated bleaching. Mesophotic coral reefs are one of the few remaining ecosystems on earth to remain largely unexplored. “We need to know more about mesophotic reefs, and we need proper ways to manage the seas in which they’re located”, says Peter Harris, Managing Director of GRID-Arendal and one of the editors of the report. The lifeboat report’s main recommendations are: to locate where mesophotic reefs exist, with a priority in the equatorial Indo-West Pacific and eastern Atlantic; to increase our understanding of how they are connected to shallow reefs in order to understand the extent to which they can be used as a refuge for, or to reseed, shallow reefs; and to raise awareness amongst managers and policy makers of the importance of their ecosystem service values and encourage measures to protect them. These tools may support implementation of the proposed UNEA-2 resolution on coral reefs. Coral reefs -- stunning, critical habitats for an enormous array of prized fish and other species -- have survived five major extinction events over the last 250 million years. Now, an international team of scientists led by Rutgers faculty has conducted the world's most comprehensive analysis of coral genes, focusing on how their evolution has allowed corals to interact with and adapt to the environment. A second study led by Rutgers researchers with colleagues at the University of Hawaii shows -- for the first time -- how stony corals create their hard skeletons, using proteins as key ingredients. "There are a few key genes in corals that allow them to build this house that laid down the foundation for many, many thousands of years of corals," said Debashish Bhattacharya, a professor in the Department of Ecology, Evolution and Natural Resources in the School of Environmental and Biological Sciences at Rutgers. "It couldn't be any more fundamental to ocean ecosystems." "I think one of the more interesting aspects of these data will be to understand which coral species may become winners or losers in the face of anthropogenic climate change -- what makes them tougher and what makes them susceptible to changes in temperature, changes in ocean acidification," said Paul Falkowski, a professor who leads the Environmental Biophysics and Molecular Ecology Laboratory at Rutgers. The coral gene database study, led by Bhattacharya and Falkowski, was published today in the journal eLife. The study stems from an international coral genomics symposium and workshop held at Rutgers in February 2014 that was funded by the National Science Foundation. The stony coral study was published in the Proceedings of the Royal Society B: Biological Sciences last month. Nearly all corals are colonial organisms that consist of as many as hundreds of thousands of animals called polyps. Types of corals include stony, shallow-water species that build reefs, soft corals and deep-water corals that live in dark cold waters, according to the National Oceanic and Atmospheric Administration. Corals face four major threats from humans: Destruction of reefs by grenades and poison used to kill fish for food; nutrient pollution, usually from sewage or agricultural runoff, that overstimulates harmful algae; increased heat in the upper ocean, which causes most coral bleaching that can kill reefs; and acidification of the ocean, according to Falkowski. "Corals are the most diverse marine ecosystems on the planet," he said. "But their value to marine ecosystems -- and to our own use of marine resources -- is very underappreciated." Recent aerial and underwater surveys have found that 93 percent of the Great Barrier Reef off Queensland in Australia has endured very severe, moderate or at least some coral bleaching this year, according to the ARC Centre of Excellence for Coral Reef Studies in Australia. The reef, a world-renowned tourist attraction, is about 1,430 miles long. Elevated sea temperatures from global warming can cause corals to expel tiny, colorful algae, according to the center. Corals turn translucent and white when they lose the algae. Mildly bleached corals can recover if the temperature drops and algae can recolonize them. If not, corals may die. At Rutgers two years ago, leaders in the field of coral biology and genomics met to plan an analysis of 20 coral genomic datasets. The goal was to provide a comprehensive understanding of coral evolution since the organisms appeared on Earth 525 million years ago. The coral database, which includes corals in tropical waters, has been posted on the comparative.reefgenomics.org website to foster growth in this important area of research. The eLife study's major advances include explaining the origin and evolution of the unique genes involved in the creation of hard skeletons by corals. The study also serves as a novel toolkit compared with the genes of humans, shellfish and other animals with hard skeletons. Bhattacharya and coauthors found dozens of genes that allow corals to coordinate their response to changes in temperature, light and pH (acidity vs. alkalinity) and deal with stress triggered by the algae that live with them and exposure to high levels of light. Surprisingly, some of these stress-related genes are of bacterial origin and were acquired to help corals survive. An intriguing theory that arose from the study is that the vast genetic repertoire of corals may help them adapt to changing ocean conditions. The study in the Proceedings of the Royal Society B: Biological Sciences -- led by former Rutgers Department of Marine and Coastal Sciences post-doctoral fellow Tali Mass -- explains how stony corals make their hard, calcium carbonate skeletons. It also explains how this process might be affected as the oceans become more acidic due to climate change. Acidity increases as oceans are exposed to higher concentrations of carbon dioxide, the main greenhouse gas and cause of climate change, in the atmosphere. "The aragonite (hard skeleton) is not just minerals," Bhattacharya said. "The proteins are very important for giving it shape and making it stable." Falkowski said the study serves as a model for understanding how we can regenerate bone. "There are amazing parallels between the production of the skeleton of coral and production of bone," he said. To protect the Great Barrier Reef the Queensland Government has set ambitious targets of reducing nitrogen by up to 80 per cent and sediment by up to 50 per cent by 2025 in key catchments such as the Wet Tropics and Burdekin. The Queensland Government has committed to invest an additional $90 million over five years to secure progress towards the targets through water quality initiatives, scientific research and helping businesses to transition to better environmental practices in the primary production industries. The Great Barrier Reef Water Science Taskforce was established in May 2015 to determine the best possible approach to achieve these outcomes. The key objective for the Taskforce was to provide advice to the Queensland Government on how to help ensure that clean water flows from the rivers to the sea to protect the reef for future generations. View the Great Barrier Reef Water Science Taskforce Terms of Reference (PDF, 39K). Queensland’s Chief Scientist Dr Geoff Garrett AO was chair of the Taskforce. A full list of the Great Barrier Reef Water Science Taskforce members (PDF, 99K) is available to view online. The Palaszczuk Government will use recommendations from Great Barrier Reef Water Science Taskforce, handed to it today, to allocate its $90 million over four years to deliver cleaner water for a healthy Reef. The Taskforce, chaired by Chief Scientist Dr Geoff Garrett, has recommended a greater focus on innovation, education support for farmers and expanded monitoring of water quality. Dr Garrett presented the Taskforce’s findings to Minister for the Great Barrier Reef Dr Steven Miles at Parliament House today. up to $11 million to ramp up existing Reef-wide monitoring efforts to provide more comprehensive information to farmers. Dr Miles said the Government will consider the Taskforce’s recommendations in full and consult closely with regional stakeholders. “There are a number of actions recommended by the Taskforce that we can begin to implement immediately,” he said. Dr Miles said that the Queensland Government would be looking to leverage the $90 million as much as possible with co-investment and public-private partnerships. Dr Garrett said there was no one tool or silver bullet to save the Great Barrier Reef. “A mix of tools are required including incentives, regulation and innovation,” Dr Garrett said. “While we acknowledge the efforts to date, it is abundantly clear that more widespread and rapid action is required. “Everyone including farmers, graziers, developers, the resources sector, community members, traditional owners and tourism operators must be part of the solution. “Achieving the water quality targets in the timescale proposed is likely to be well beyond the funds currently allocated by the Queensland and Australian governments. “The Taskforce found that even full application of best management practices across all farms in the reef catchments would not achieve the targets, therefore, a strong focus on innovation, new technologies and different ways of thinking is required. “We need a fundamental shift in the way land is managed. The challenge will be to lead a significant management change program across such a vast scale,’ Dr Garrett said. A consortium of economic and water quality experts would continue to assess the costs and effectiveness of various solutions to identify the total investment that may be required to meet the targets. This work is expected to be completed by July 2016. 1. Review targets in 2016, feeding into the review of the Reef Water Quality Protection Plan. 2. Substantially improve communication and information to build understanding of the pressures on the reef and to support management practice and social change. 3. Invest in more effective, targeted and coordinated extension to support large scale land management practice change. 4. Establish greater use of incentives and market approaches to support water quality improvements. 5. Implement staged regulations to reduce water pollution throughout the reef regions. 6. Better align science and fund development of new ideas and solutions. 7. Fund additional long-term and finer-scale catchment monitoring, modelling and reporting for improved decision making and adaptive management. 8. Implement two, well facilitated major integrated projects (MIPS) in pollutant ‘hot spot’ areas to evaluate the most effective combination of tools to inform the design of future programs. 9. Investment planning: Develop a strategic investment plan and establish reef-friendly public-private partnerships. 10. Simplify and strengthen governance and clarify roles and responsibilities within and between the Queensland and Australian Governments. Great Barrier Reef Water Science Taskforce members share their views on the final report and future of the reef.